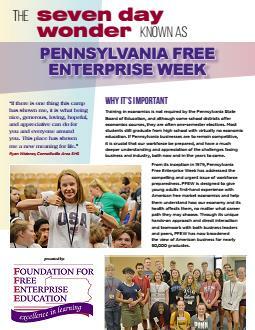 Pennsylvania Free Enterprise Week is an intensive program that educates high school students about the American free enterprise system. Bringing motivated students together with business people from throughout the state. This unique concept in learning has enhanced the lives of nearly 50,000 young adults for more than forty years. If Pennsylvania businesses are to remain competitive, it is crucial that our workforce have an understanding and appreciation of the challenges that face the business community. At PFEW, old myths about business unravel as students and business people work together, gaining fresh insights into the intricacies of our free market system. Participants are challenged with a plethora of economic concepts, terms, facts, figures, and projections for the future. Inspirational speakers creatively address subjects concerning marketing, business and government cooperation, supply and demand, and the role of business in our economy. Last year, over 2,100 students shared the challenge and adventure of PFEW. Those practicing business today translated the real world of private enterprise for tomorrow's leaders. An educational program like no other, PFEW is an opportunity every eager student should have the chance to experience.